I want to save as many teeth for my patients a possible. As I always say, the best dentistry is no dentistry at all. In other words, preventing disease is always better than treating it. Obviously there comes a time when treatment needs to be done. Fortunately, dental therapies are improving the outcomes for patients. But inevitably some teeth cannot be saved and need to be removed or extracted. 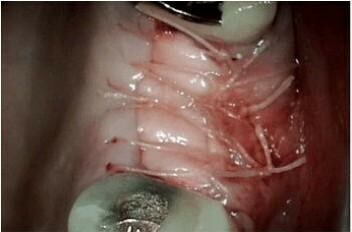 When a tooth is removed (extracted), ideally, all the soft tissue and infection should be removed from the socket. Soft tissue would include tissue associated with an abscess and infection and the ligament tissue between the roots and the bone. In our Charlotte North Carolina practice, after the socket is cleaned out, I will treat the socket with ozone. I will use ozonated water and oxygen-ozone gas to further reduce infection in the bone and promote proper healing with the other benefits of ozone. 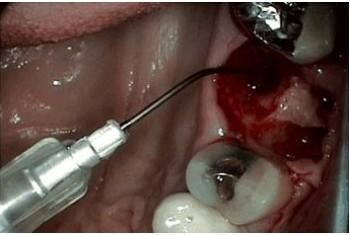 Finally, I want to seal the cleaned socket from the rest of the mouth by placing biocompatible graft material. This is called a ridge preservation procedure. This procedure will encourage proper healing, speed the healing, preserve bone, prevent gum tissue from entering the socket and help prevent microbes from the mouth from entering the bone. First picture (above) shows socket after tooth was removed. Second pictures shows graft material placed in socket and membrane being placed. Third pictures shows membrane in place over graft. Socket in bone after tooth removal. Oxygen-ozone being placed in socket. 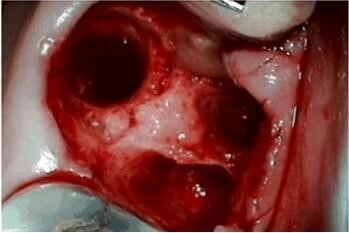 Bone graft placed in socket. Membrane in socket sutured over the bone graft.